Winner of Toowoomba Traders Awards summer 2004 & 2005. Proud supporter of the Special Children’s Christmas party since 1994. Family owned and operated in Toowoomba since 1988. Wellcamp Furniture Removals is a locally owned business in operation for nearly 30 years. 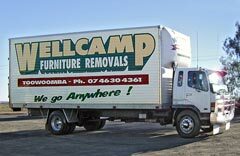 Based near the Wellcamp Airport, on the outskirts of the city of Toowoomba, Wellcamp Furniture Removals relocates people’s belongings throughout Queensland, Australia and Worldwide. With friendly, efficient and professional staff Wellcamp Furniture Removals offer home or office relocation together with furniture deliveries, packing materials and storage facilities. Wellcamp Furniture Removals specialise in pianos & pool tables, while pet and vehicle transport can also be arranged.